"From the director of "New Jack City""
Jessie Lee wants revenge! He would love to do it by himself, but he knows he can't. What does he do? He gets his Posse together! Starring a large ensemble cast of up-and-comers, veterans and never-beens, the movie is one of much excitement, action and violence! Some of the actors had their first big break in this film, while a few had their last. Starring and directed by Mario Van Peeples, the story is recanted in flashback fashion by veteran actor Woody Strode. He talks of how the Buffalo soldiers from US Army's 10th Calvary Regiment are barely holding on in battle. In response, Jessie runs back to ask the colonel for his unit to fall back. The colonel offers him an ultimatum, and Jessie refuses, thereby setting the stage for the rest of the action-packed story. The unit and one white prisoner join together after being betrayed by a corrupt and racist colonel, who set them up so they could be executed. 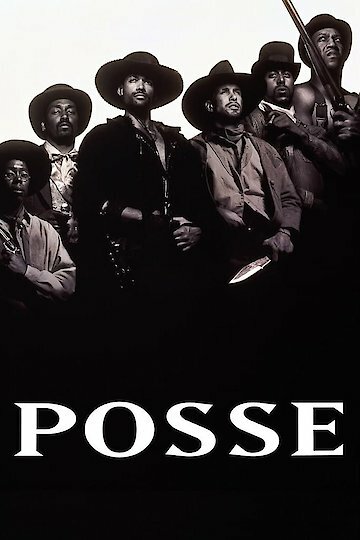 Posse is one of the few movies of the time of release that depicted the black cowboy and soldier prominently. Posse is currently available to watch free on The Roku Channel, Vudu Free and stream, download, buy on demand at Amazon, Vudu, iTunes online.